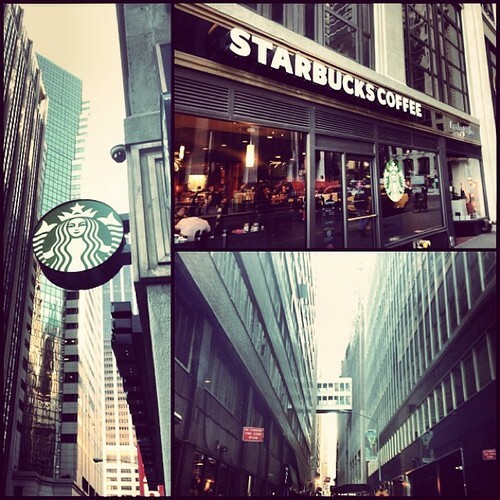 The Starbucks at Platt street and William street in FiDi is an anomaly. From the outside, it looks amazing. It’s exterior is all platted glass. There’s an interior Starbucks sign that curves along with the exterior structure. It’s located inside the beautifully decorated courtyard of the large office building at One William Street. And everything in close proximity seems to glow due to the luminous pillars and overhead lights of the courtyard. Unfortunately, the magic fades once you enter the Starbucks itself. The structure of the lobby curves along with the arching exterior. And since there’s only one entrance, this causes a good deal of bottlenecking at the end of the line where patrons are waiting to pick up there drinks. I arrived at 5pm today and the crowd was not too bad, but I can’t imagine what this Starbucks looks like during the morning rush. Don’t get me wrong. This Starbucks is beautifully decorated. But its size and design flaws seem somewhat impractical for a busy FiDi location. I found it! 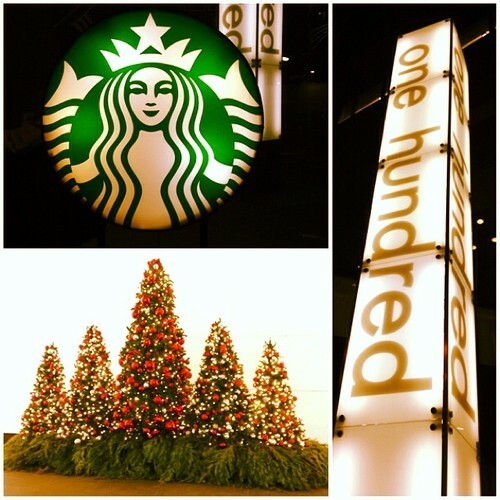 I’ve been waiting to come across this Starbucks since I started this blog. No… the Starbucks on Carlisle and Washington is nothing spectacular — quite the opposite actually — but it holds a special place in my memory as it is one of the Starbucks I came to when I first visited NYC. Actually — I don’t even think I purchased anything at this location, I just really needed to use the restroom after paying my respects to the 911 Memorial. And now that I’m thinking about it, that action was a clue that I was meant to be a New Yorker. This Starbucks is actually attached a part of the Marriott Downtown which is right of the West Side Highway of Manhattan. 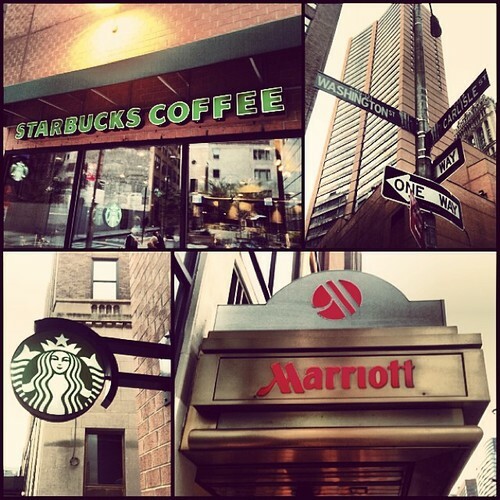 You can either enter the Starbucks through the lobby or its separate entrance on the backside of the Marriott. I think we must have been lost when we stumbled upon this location, because the cross-street of Carlisle and Washington isn’t exactly out in the open. Once inside you’ll notice a couple of things. It’s extremely small. It has only one small stretch of seating. And there is no public restroom. If you’re really observant, you’ll also notice that this is a licensed Starbucks (probably owned by Marriott). The give-away? They don’t have the Starbucks App scanners and the receipts look different. Also the Internet is not AT&T WiFi or Google WiFi; it’s provided by the Marriott and doesn’t seem to work properly. Thanks to the sheer density of Starbucks in Lower Manhattan, I’m beginning to know my way around the Financial District despite its irregular street names. In fact, the other day I was downtown giving directions to my boyfriend — who’s lived in NYC for 6 years, mind you. One thing I’ve noticed about these FiDi Starbucks, is that they range greatly in quality. Basically, they are either great or just horrible. Location doesn’t even seem to be a factor in this — especially since they’re all so close together. And my experience today only further solidifies this theory. 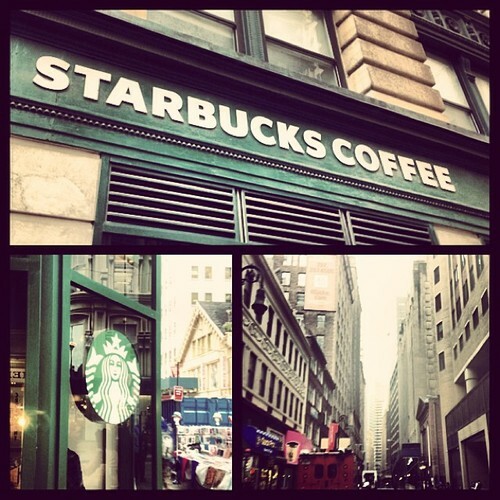 I’m at the Starbucks on Fulton & Nassau. 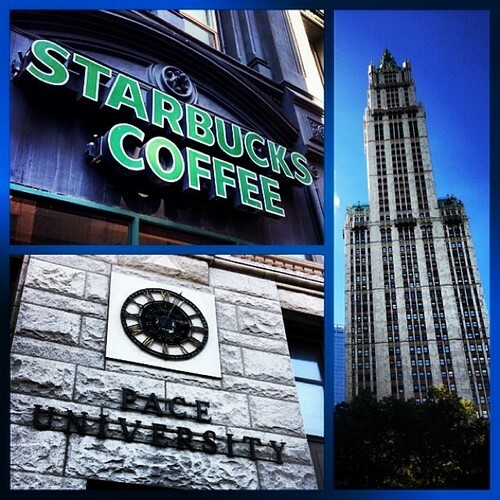 This Starbucks is only 2 blocks north of the very classy, unique Starbucks at Liberty & Nassau. However, it is lacking all of the decor styling and 80 percent of the seating. The best thing I can say about this Starbucks is that it’s in a good spot and has two doors. Also, the barista that took my order was friendlier than your typical NYC Starbucks barista, and that is something I will always appreciate. It’s finally here. 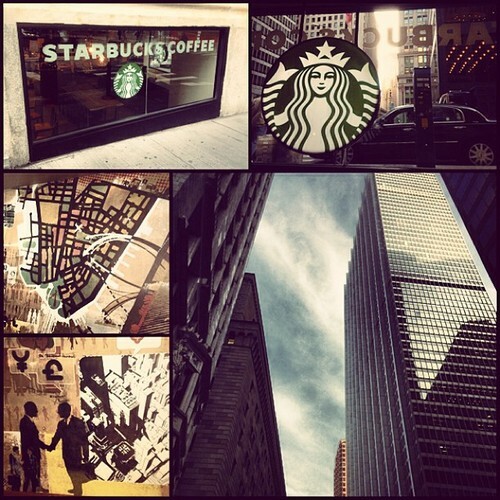 I’m officially typing this blog using Google Wifi at the new Starbucks on Front & Wall Street. At first I thought this Starbucks was having WiFi issues, then I kept searching for available networks until ‘Google Starbucks’ showed up. I connected with ease and began testing the bandwidth to see how it compared to the old AT&T WiFi. So far, I’m impressed. According to one of the baristas, this Starbucks has only been open for about a month. It still has that new store glow. 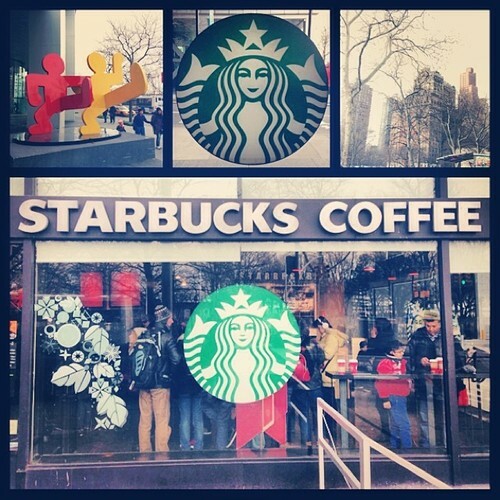 And I have a feeling this Starbucks is just reopening after suffereing damage from Hurricane Sandy. I can literally see the water of the East River from outside this Starbucks door, and I can easily imagine the flood waters putting this location out of service for quite some time. But maybe some downtime did this Starbucks well. Now it’s back, and I’m assuming it’s never looked better. The lighting and decor is crisp. There’s silver and grey accents all around, and when combined with the metal tables and wooden floorboards it creates an interesting and modern aesthetic. It has plenty of seating and still provides enough room to keep the place from feeling cramped. 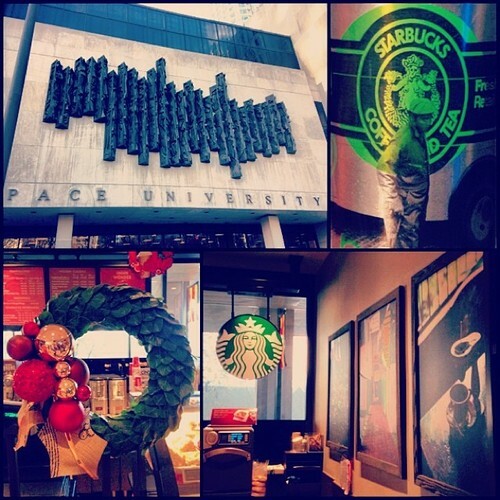 This new Starbucks certainly isn’t helping me finish this blog by the year’s end, but it is a beautiful addition to the NYC Starbucks family. What I wouldn’t give to see New York City in its early days — I’m talking 18th or 19th Century. 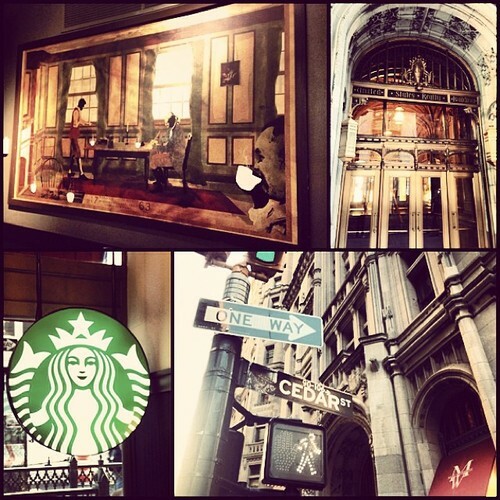 And today my adventure took me to a Starbucks location that has been a coffee house for over 200 years. 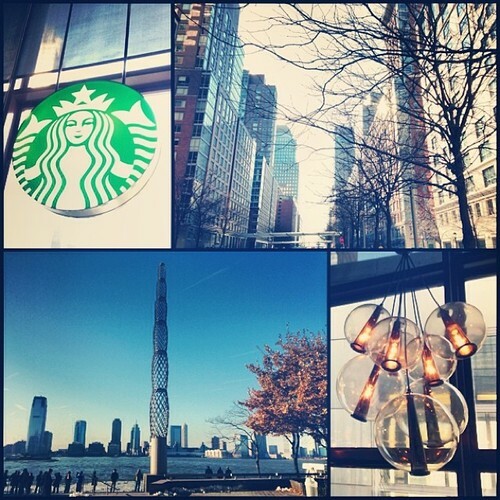 I had the pleasure of visiting the Starbucks on the corner of Thames and Broadway in downtown Manhattan. From the exterior architecture alone, I could tell I was going to like this Starbucks. It looked anything but typical, and when I walked inside I got an eyeful of New York themed artwork, dark wood paneling and crowded tables for two. I also spotted this large peculiar box that I soon realized was an elevator for the disabled to access the barista bar, which is a few steps elevated from the seating area — thanks American with Disabilities Act! Once I ordered my drink, I came across a large painting on the far back wall of the Starbucks (above). Depicted is what looks like a cafe during colonial times, and it was labeled Burns Coffee House: 1763. Of course, I did my research and found out that this Starbucks is in the very spot that Burns once stood. It makes me wonder how a coffee house operated in the 1700s. I doubt they had iced coffee. So despite the fact that this Starbucks is sort of small, kind of dark, and has no public restroom, I’m giving it a 4-Cup rating because of it’s history and uniqueness. I was standing at the corner of Liberty and Nassau looking left and right, thinking to myself, Where is the hell is this Starbucks? One thing I’ve learned about the Starbucks App is just because it says there is a Starbucks on a certain street corner, does not mean it is actually there or easy to find. Convinced this Starbucks must be hidden inside one of the lobbies of the towering skyscrapers, I looked down in frustration… which is when I spotted the familiar Starbucks siren in a narrow window no higher than my waist. This Starbucks is practically underground when looking at it from Liberty Street; however, as you walk around the corner onto Nassau, the sidewalk slops and you can enter the building at street level. Already impressed by its unique street corner positioning, I walked in expecting greatness and was not disappointed. No, it’s not the largest or most accommodating. But it has class. The wall mural (depicted above) is distinctive to the Financial District. The communal table has that consists of real wood two-by-fours and has that hand-crafted look. It was clean, not crowded and had a good vibe that makes my think I’d be quite productive working out of this location.